A lot of people I speak to would like to use the inking features of Windows 8.1 and their surface – especially the Ink-to-Text feature of OneNote however they struggle to make the process efficient for them and get frustrated when things don’t work out as expected. One of the biggest frustrations is not having your handwriting properly recognized by OneNote. I’ve spoken about the feature in Episode 4 of the Surface Smiths Podcast and in Episode 5, I speak about the Surface App that you can use to customize the pen sensitivity to better suit your writing style and in Episode 6 6, I speak about how to train your surface to better recognize your handwriting. This blog post provides step by step instructions on how to personalize the handwriting recognition in Windows 8.1 and the MS Surface Pro. These instructions should also work on the Surface 3 however I haven’t tested them. You have about an hour to go through all of the training. Don’t worry if you run out of time, you can save and complete it later if you need to. You will be prompted to train on both Sentences and Numbers, Symbols and Letters through a series of wizards. Get to work! IF things don’t work out perfectly, you can fine tune the recognition for specific errors or restart the training from scratch. This entry was posted in Surface Pro, Windows 8.1. Microsoft just announced a new model to the Surface Pro 3 family of devices. It is the Intel Core i7 with 8GB of RAM and a 128GB SSD. Previously the i7 models were only available with either a 256GB or 512GB SSD. 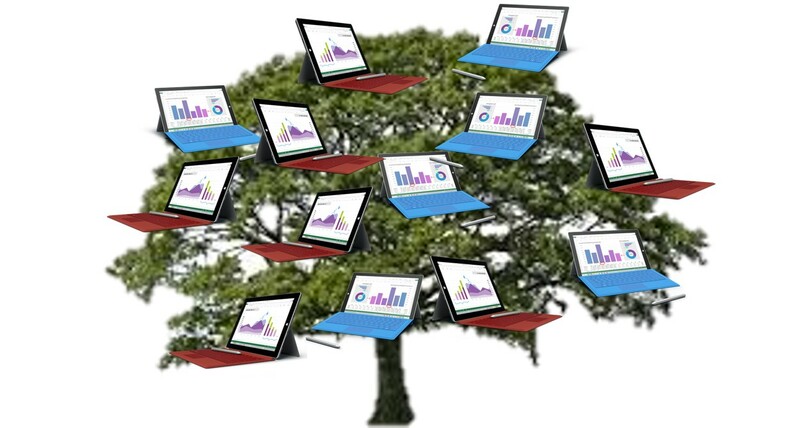 This generation of the Surface family tree is growing quickly. I guess success breeds new devices. So who do the new devices appeal to? Sales figures will ultimately determine that but my guess is that the new i7 is targeted at somebody that prioritizes price and performance over storage (remember that the SP3 has a SD slot and has a USB3 port). If most of your data is stored on a corporate network, OneDrive or some other location, this may be a reasonable compromise. The LTE devices are targeted at vertical applications that require constant connectivity (think jobsite) or the user that doesn’t want to tether to a mobile phone (for any number of reasons, data plan, battery, etc.). Let me know the use cases that you think these devices would be good for and I will discuss them on an upcoming episode of the Surface Smiths Podcast. This entry was posted in Microsoft Surface, Surface Pro. I’m at Microsoft Ignite this week and I have been attending some great sessions. Yesterday (Surface 3 launch day) I attended a session by Cyril Belikoff from the Surface team. I asked him for some guidance on which use cases were better suited to the Surface 3 and the Surface Pro 3. He happened to have a slide available that explained the way the Microsoft thinks about it. I stole borrowed elements of the slide to create the image above. What it boils down to is that there is a spectrum of needs and requirements. People need a laptop but want a tablet. Depending on their use case, they may be better served at the “tabletty” end of that spectrum of the “laptoppy” end of the spectrum. 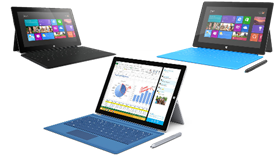 The Surface 3 is closer to pure tablet end of the spectrum while the Surface Pro 3 is closer to the pure laptop end. This entry was posted in Surface Pro. The following is a copy of the content you would have found if you followed the link above to Microsoft Surface FAQ today. The FAQ is evolving and I have been adding content regularly. I feel it now has sufficient content to post a copy of it as a blog post to inform you about it. Bookmark the actual FAQ for future reference as this post will be static but the FAQ won’t be. This is a series of questions and answers cobbled together from questions I have been asked, questions on Reddit and questions on SurfaceForums.Net. It is still a work in progress. If you find it helpful please share with others (if you don’t find it helpful, share it with somebody you don’t like). If you have any questions that you would like to see here, please leave a comment. BTW – a great resource for Surface owners and prospective Surface owners is lovemysurface.net. What’s the difference between Surface RT and Surface Pro? My friend can install Windows 7 programs on his Surface Pro. Why can’t I install them on my Surface RT/Surface 2? How do I use CTRL+Fn keys like I do on a normal keyboard? Can I use the Surface Pro 1/2 pen with the Surface Pro 3? My speakers aren’t loud enough. How can I increase the volume? How can I extend the battery life on my Surface? How do I enable a Picture Password? How can I convert handwriting to text? How can I connect my Surface to a wireless display? How can I use the Surface Pro pen for navigation? My Surface only has a headphone jack. How can I connect a microphone to it? How can I monitor my battery usage? Surface RT (and Surface 2) run Windows RT. Windows RT is a special build of Windows that only runs on the ARM processor architecture. The Surface devices with “Pro” in their names (Surface Pro, Surface Pro 2 and Surface Pro 3 at the time of this writing ) run the same versions of Windows available for desktops and laptops. This version of Windows is designed to run on the Intel x64 architecture and run Windows 8.x using the same binaries as Windows 8.x on a normal desktop or laptop computer. The RT is more like a traditional tablet with long battery life, running cooler, and instant on. Of course the dimensions are a little different as the RT is slimmer than the Pro. Just as the version of Windows that runs on the Arm processor is different, so are the binaries for the applications that run on the different processor architectures. The application would need to be recompiled to and potentially modified to run on Windows RT. Press the Fn key at the same time as the function keys to have them act as normal function keys. You can also toggle them between special/normal by pressing Fn and CapsLock. The Surface Pro 3 switched from the Wacom pen technology to the n-Trig pen technology. As a result, while the pen used with the Surface Pro 1 and 2 is interchangeable with each other, the Surface Pro 3 pen cannot be used on earlier models and the Surface Pro ½ pens will not work on the Surface Pro 3. Windows RT devices do not support either the Wacom or the n-Trig pens. Turning on the loudness equalization might help. Navigate to Control Panel, click Sound > click on Speakers click on Properties click the Enhancements tab, select the Enable check box. Tap or click Accounts, and tap or click Sign-in options. Under Picture password, tap or click Add. Sign in with your Microsoft account info, then follow the steps on the screen to choose a picture and pick your gestures. OneNote has the ability to convert handwriting to text. On the draw menu, simply select the Ink to Text button on the ribbon. For more detailed information read this article. Hover pen above screen: Moves the mouse cursor around, allowing you to perform mouse hover actions. Tap pen on screen: Performs a left-click. Press on screen and hold down: Performs a right-click after a moment’s wait. Hold button on pen and tap pen on screen: Performs a right-click immediately. My Surface only has one audio jack. How can I connect a microphone to it? Connect a combo headset/microphone that uses the a single 3.5mm jack. These are commonly used with smartphones. Use a splitter to create two separate jacks: one for input and one for output. Use a bluetooth to connect a headset/microphone. Use lower screen brightness settings as appropriate. You can set it manually from the Charms>Settings>Screen or Fn+Del / FN+Backspace. Avoid using Chrome. Many Surface users have reported high CPU and fan usage when using Chrome (especially multiple tabs). This may not be an issue in the future.